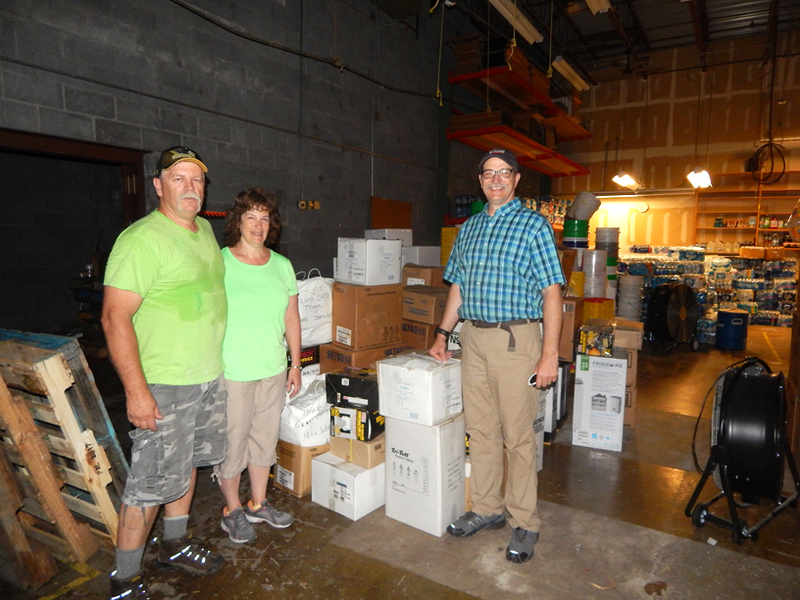 Kali Katerberg/Daily Mining Gazette Bryan (left) and Sharon Early pose with regional volunteer coordinator Jon Stone in front of the trailer load of supplies they transported from upstate New York to aid flood victims. 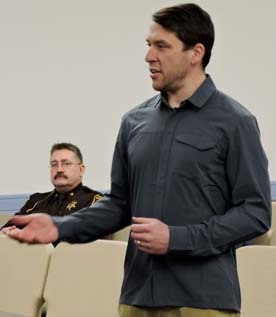 HOUGHTON COUNTY — With the initial June 17 flood disaster work completed, the Copper Country has a new challenge to overcome — a shortage of volunteers. The new volunteer and donation center in the Copper Country Mall’s former JCPenney store opened this weekend to low turnout due to storms and volunteer burnout, but there is still a lot left to do. “We have a crisis as far as staffing. I don’t know how we’re going to open Monday,” said regional volunteer coordinator Jon Stone. 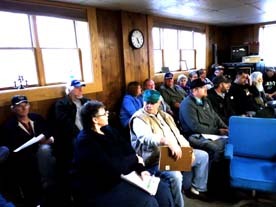 People are needed to keep the distribution and volunteer center running and organized, Stone said. He himself will need to return to work on Monday, leaving a gaping hole. “Everyone has done so much. It’s so hard to go back to people that have already given all these hours and say, ‘You know, we need more help,’ but if we don’t, critical things like (the) volunteer center that organizes all the volunteer effort or the donation center, they will have to close. That’d be terrible for the community at this point,” Stone said. He is hoping local nonprofits and churches will be able to provide staffing for a single day, a week or every other week, but even a little time helps. Future needs also include going from door-to-door for damage canvassing, and manual labor like tearing out carpet and drywall in water-damaged basements to prevent mold and prepare for rebuilding. Stone has enough work for a minimum of 50 volunteers a day, and there is plenty to do that is not manual labor. Tool-wise the biggest need is for dehumidifiers, but hand tools like hammers and crowbars for carpet and drywall removal will also be important. “The emergency response stuff here was done within 24-36 hours, but now we’re in that prolonged recovery process,” he said. Stone anticipates volunteers for tear-outs and organization will be needed at least through July. “Copper Country strong has just been amazing. Now we have to just finish it. It’s like we got that first initial surge, and now we need to move from the sprint to the triathlon,” Stone explained. Saturday saw a few additional flooding issues and washouts that the volunteers responded to due to weekend rains. Otherwise volunteers spent the weekend going door-to-door asking about damage to report back to the Portage Health Foundation and cleanup database, said volunteer Julie Beck. Though her own home sustained damage, she has been out since Thursday, chipping in adding time where she can. Anything people can do is “one piece of this giant puzzle that needs to be put back together again,” Beck said. Also on scene were Sharon and Bryan Early, who turned a trip from upstate New York to pick up their Tech student son into supply delivery. The couple had been through both flooding and flash flooding, running a center of their own, and knew exactly what to bring. They unloaded a trailer full of much-needed dehumidifiers, fans and other now limited tools Sunday. The donations came in part from their church or were leftovers from their own flood response. The key to continued recovery will be consistent volunteers and qualified coordinators said Sharon Early. “We’ve been through it so we know, we also know when the volunteers start drying up how hard it is to keep going,” she said. Though things quickly got back to normal for most people those affected still need help and support.